Sliding patio doors are notoriously difficult when it comes to window treatments. Clients ask me for new options all the time and, thankfully, there are several window treatment options that will help you control the light and privacy at your sliding patio door. Sliding patio doors are challenging because, unlike French doors or other swinging doors, a blind or shade cannot be installed directly to the door panel. Instead, the shade must be installed either above or to the side of the door to allow the door to operate properly. This does limit the number of options for window treatments, but the options have grown in the past several years. 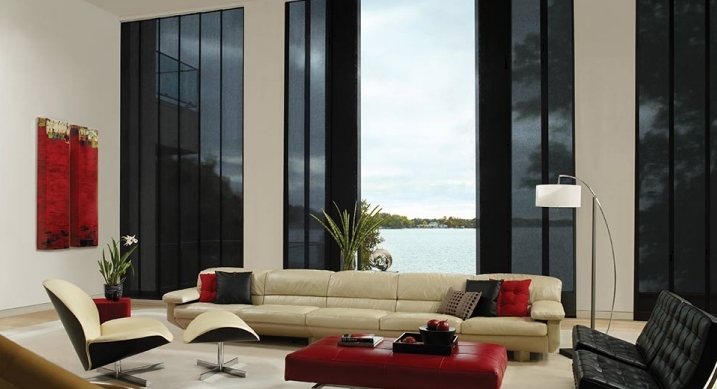 When most folks think about adding a blind or shade to their sliding patio door, they immediately think “vertical blinds.” Unfortunately, these same folks also think “yuck!” Vertical blinds, while they do control light and offer privacy at a patio door, are not everyone’s favorite window treatment option. They can be noisy and unattractive, but there are newer vertical blinds on the market that give homeowners stylish options to choose from. Hunter Douglas‘ Crosswind Wood Vertical Blinds product coordinates with their wood blind colors, giving you a way to coordinate your window blinds and patio door vertical blind seamlessly. 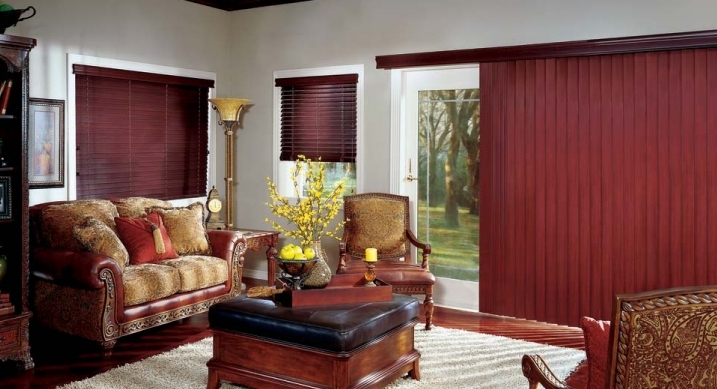 Wood verticals offer a more upscale look, while retaining the versatility of a vertical blind. Hunter Douglas also offers a shaped vertical blind called Cadence. While it is still a vinyl vertical blind, the shape of the vanes looks like fabric from a distance, enhancing the look of the blind. These are more expensive than traditional vertical blinds, but the look is unique. 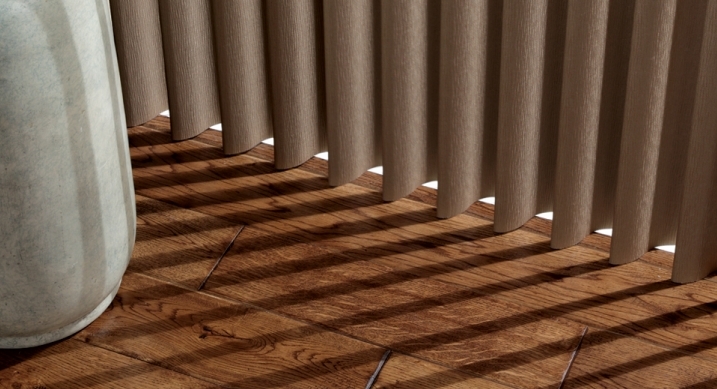 If vertical blinds are not your style, consider a honeycomb shade. Both Graber and Hunter Douglas offer vertical honeycomb shades, which slide across the patio door. The biggest advantages to this option are the enhanced insulation at the door and the small stacking space at the side of the door. While a vertical blind or drapery may take up 18″ or more at the side of a patio door, a vertical cellular shade takes up just 6-13″. If you are looking for a shade that is there when you need it, but inconspicuous and out of the way when you don’t, this could be a great option for you. The disadvantage is that, unlike a vertical blind, you have no vanes to tilt to allow in a little light or view. With a honeycomb shade, it is either open or closed; they just don’t have the flexibility of a vertical blind. Another beautiful option for patio doors is the vertical sheer shading from Hunter Douglas called Luminette. This shade provides the look of a sheer drapery with the versatility of a vertical blind – it has fabric vanes that can be tilted open or closed to adjust the light and view. The disadvantage of this type of shade is the large stack of fabric left at the side of the window when it is fully opened. They are also fairly expensive. They do, however, offer a beautiful look you will get from none of the other patio door window shade options. 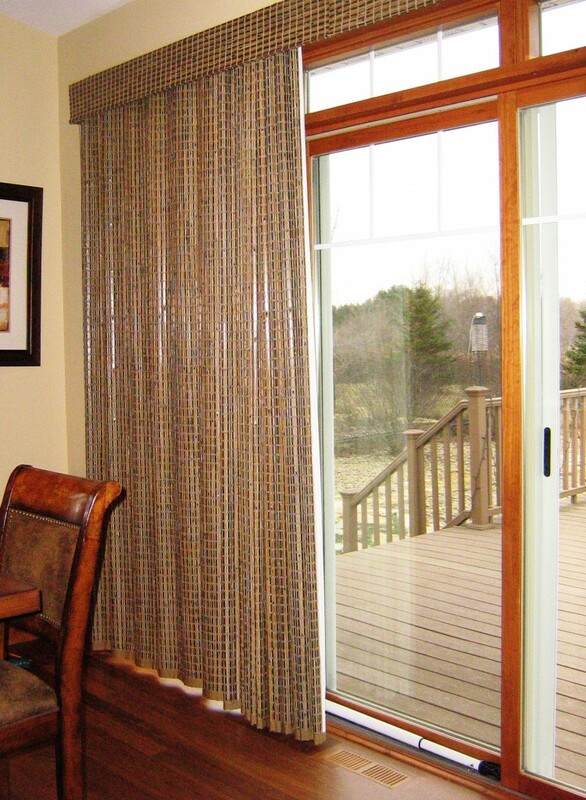 Newer to the patio door window treatment market are vertical woven wood draperies. Many companies now offer this option, including Graber and Hunter Douglas. The woven wood or grass “fabric” glides across the patio door like a drapery. They add color and texture to a space, while controlling light and view. If you choose to add a privacy or light-blocking backing to the shade, you can add even more light and privacy control to the door. Like the vertical honeycombs, these draperies are not as flexible as vertical blinds or Luminettes, but they offer a completely unique look. 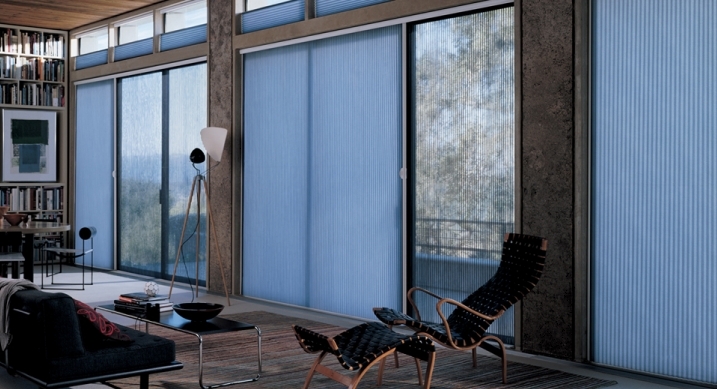 Sliding panel systems are a modern take on the vertical blind. There are many on the market today, like the Skyline Gliding Panels from Hunter Douglas. They offer a contemporary aesthetic and a range of fabrics from sheer to opaque. 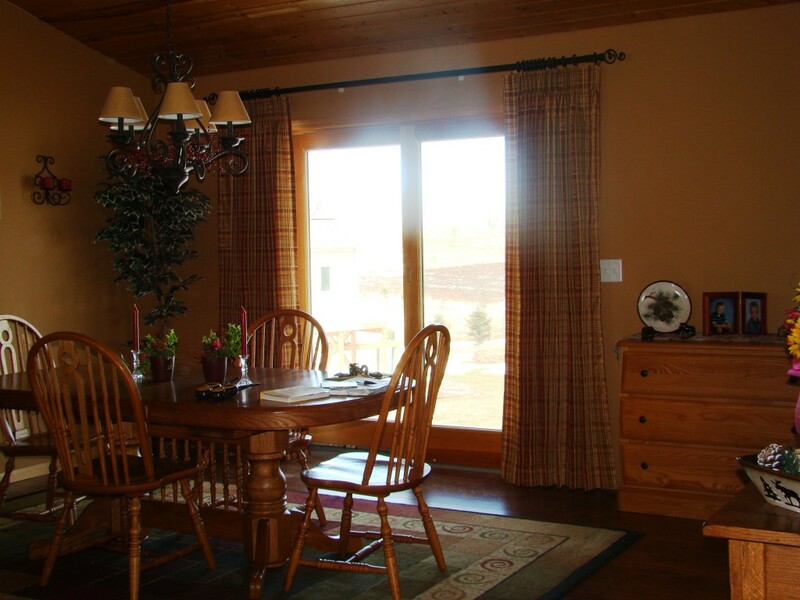 The stack is no larger than any other patio door blind options, and the unique headrail keeps them slim and trim. Lastly, full traversing drapery panels have made a comeback at patio doors. Instead of choosing a shade, some homeowners are opting to install traversing drapery panels, which control both light and privacy when they are needed, but also add a custom decorative touch at the door. They are available from places like The Shade Store, or from local designers or workrooms. Be sure to line your drapery for the best look and longevity of your treatment. One other thought: consider using a standard shade (or 2) on your patio door instead of one that slides across the door. If the door is extra tall, you can install the shades right inside the door frame. On a standard-height door, install the shades above the door frame, and conceal the headrail with a valance or cornice. While this option may not offer the convenience of a shade made for use on a patio door, it does open up new options for the door. Choose something with a small stack for best results, and to keep the shade from infringing on the head-space at your door; you don’t want guests or family members to hit their heads on the shade on their way out to your deck! Patio doors can be challenging, but there are options for window treatments out there! Take some time to learn about each one before you choose the option that is best for you. ← What is a Pendant Light?